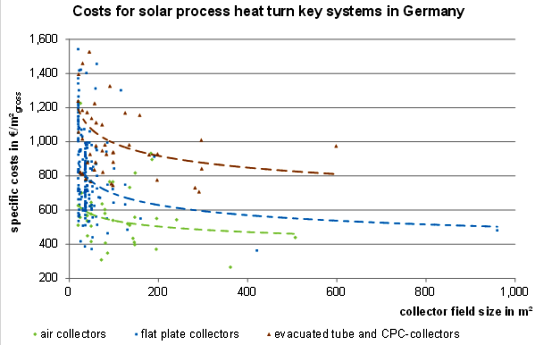 Scientists from Germany and Switzerland have recently analysed the cost structures of systems producing solar process heat. They presented their findings in mid-May at the Solar Thermal Energy Symposium, where they said they had identified great potential for cost-cutting and discovered a large spread of installation prices. Planning SHIP systems involved more work than doing the same for domestic applications, but it was the collectors that made up the lion’s share of the investment. The three-day symposium attracted around 230 experts from research and industry. As Germany’s major annual conference on solar heating and cooling, it focused this year on turnkey heating solutions, including solar ones for the housing market and industrial processes. 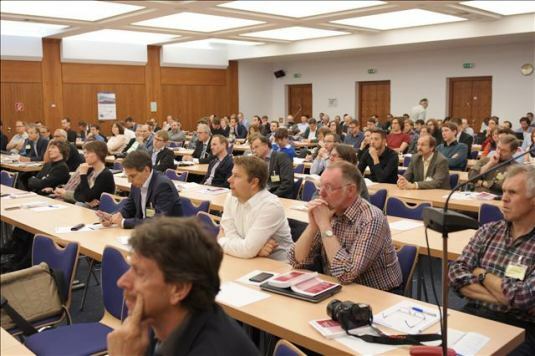 It was the 27th symposium and, at the same time, the last one organised by the East-Bavarian Institute for Technology Transfer, OTTI, which filed for bankruptcy in February 2017. The symposium’s board of advisers has taken over sponsorship until a new conference organiser is found for 2018 (see attached flyer in German). Dominik Ritter and Bastian Schmitt from the Institute of Thermal Engineering, a department of the University of Kassel, Germany, analysed the cost structures of over 250 turnkey process heat plants which had received funding in Germany between August 2012 and the end of 2016 (total of 267, with 183 of them in operation to date). They considered net costs of planning, components and parts, which included integration, installation and start-up. Particularly systems with less than 100 m² of collector area showed huge variations of total cost, as can be seen in figure 1. Sometimes, a plant was about 3.5 times as expensive as a similar one – despite comparable planning and integration efforts. The differences were attributed to a lack of competition and experience, with the latter resulting in high prices, as turnkey suppliers have added charges for unforeseen circumstances. Figure 1 also does not provide any data on system integration. Its proportion of total cost may vary significantly based on what and how many custom-made components were required, whether several heat consumers needed to be integrated or materials had to meet special requirements for hygiene, resistance to acid fluids or pressure hikes. Increasing plant size will reduce price fluctuations and the total cost per m² of collector area, as shown in figure 1. The type of collector chosen for the project will also greatly impact cost per m²: Plants with air collectors need, on average, 540 EUR/m² (minimum: 265 EUR/m²), flat plate collectors 770 EUR/m² (minimum: 365 EUR/m²) and vacuum tube collectors with CPC 985 EUR/m² (minimum: 705 EUR/m²). Dominik Ritter advises investors to ask for at least one alternative offer, in case the first one is significantly higher than the corresponding average. Ritter and Schmitt agreed that cost-saving potential was high, but was mainly dependent on significant market growth. The small market puts solar process heat companies in a weak position when negotiating with suppliers. Specialised companies will often have to add high margins to bridge the gap between orders. The two scientists from Kassel also calculated static heat cost per MWh based on solar yields, a 50 % subsidy and a 20-year system life. Eighty-four plants had data available which could be used for analysis; their cost of heat averaged 49 €/MWh. 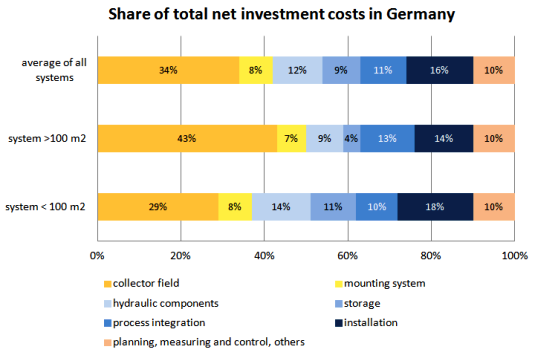 As can be seen in figure 2, collectors were the factor with the biggest impact on the cost of solar process heat, followed by installation (16 %) and hydraulic components (12 %). Measuring and control, planning and other expenses had little influence on the total. The cost structure of solar process heat was also analysed by a research team from the SPF Institute of Solar Technology Rapperswil (fig. 3). Although there is no method for a direct comparison of findings, the chart below uses the same colour to indicate similar categories found in both studies. Fig. 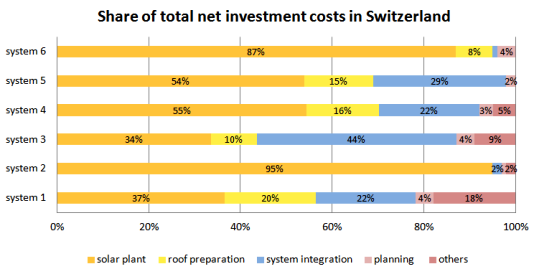 3: Total cost of six pilot projects producing solar process heat in Switzerland, as determined by SPF Rapperswil. Where totals do not add up, the difference is due to rounding.